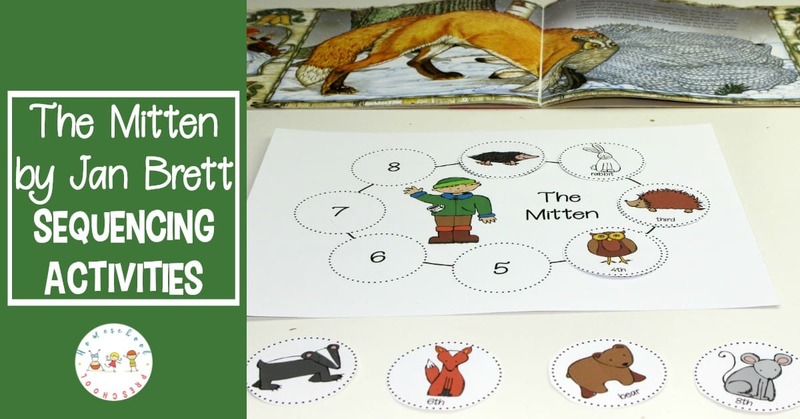 Young learners will practice ordering events with this set of The Mitten story sequence activities. Set includes sequencing discs, mat, and character cards. 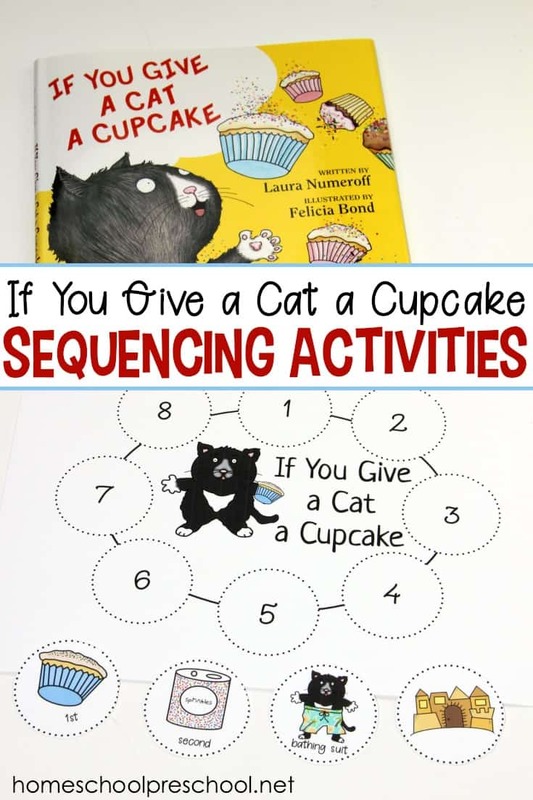 With several different activities included in this sequencing activity for preschoolers, your little ones can practice story sequencing, retelling with character cards, and ordinal number practice. All you’ll need to do is print, laminate, cut, and go! This low-prep activity will be ready for use in no time. In Jan Brett’s The Mitten, Nicki wants his Baba to make him a pair of white mittens. As he goes out to play in the snow, he drops one. A series of animals discover the mitten and snuggle in to stay warm. Your preschoolers will love the story, and Jan Brett’s illustrations add an additional level of engagement throughout the entire book. Read The Mitten with your preschoolers. Be sure to share the pictures as you read so they can follow along. Notice the mitten illustrations in the sidebar on each page. On the left, kids can follow Nicki on his adventure. On the right, kids can see what animal is coming up next. Afterward, show them the character cards. There is a card for each animal as well as the mitten, Nicki, and Baba. See if they can put the cards in order as each item/person/animal is introduced in the story. Now, show your students the story discs and the sequencing mat. There are a few versions of each of these so that you can use the one(s) appropriate for your students. One sequencing mat has numbered circles while the other is blank. There are four versions of story discs. One has just images while another has labels. Another page of discs has ordinal numbers and still another has ordinal number words. Mix and match these was your students need. Allow them to sequence the story as you read the book again. This activity is great in a center. Just print the discs and mats on cardstock and laminate for durability. Use velcro dots on the mat and on the back of each disc. Have students stick the discs to the mat in the proper order. I’ve also included ordinal number and ordinal number word labels. These work great with the character cards. Have your kids put the cards in order and then match the labels to the correct cards. This winter, be sure to read Jan Brett’s The Mitten with your kids. 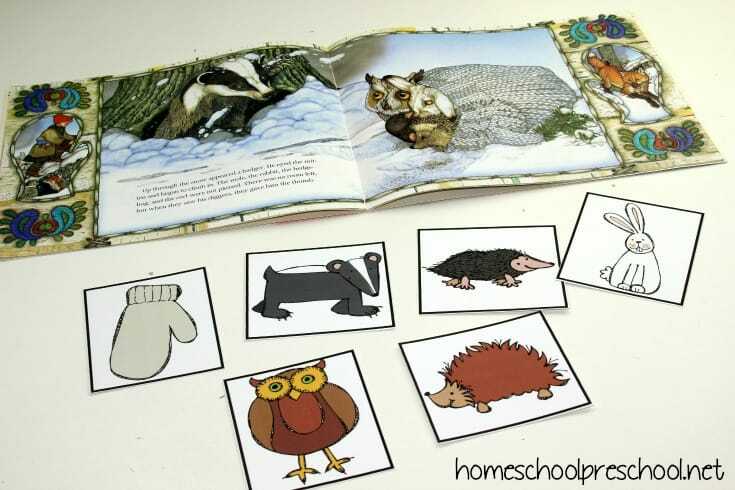 Then, choose one or more of these ten The Mitten printable activities to extend the learning. Do your kids love Jan Brett books? 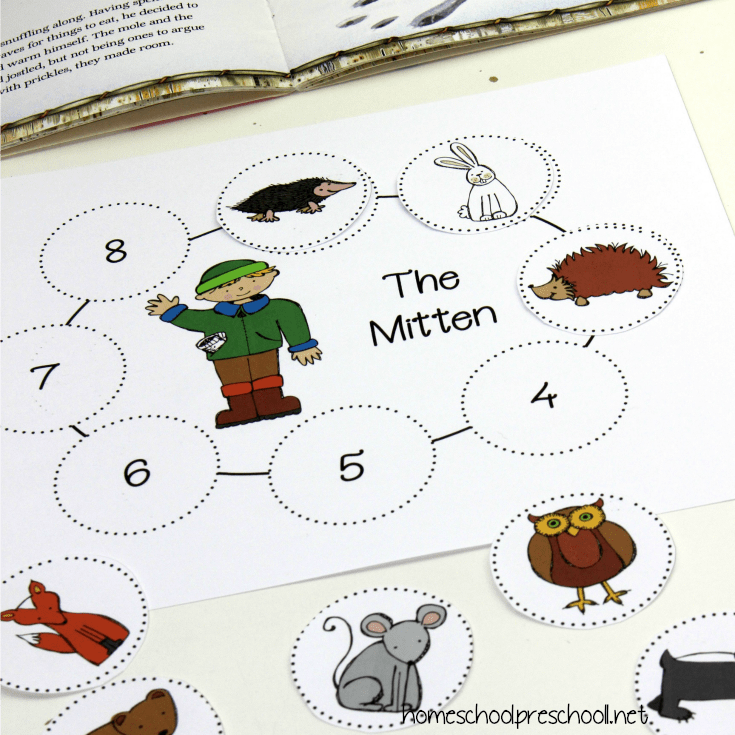 If so, they’re going to love this The Mitten story printable and hands-on activity! 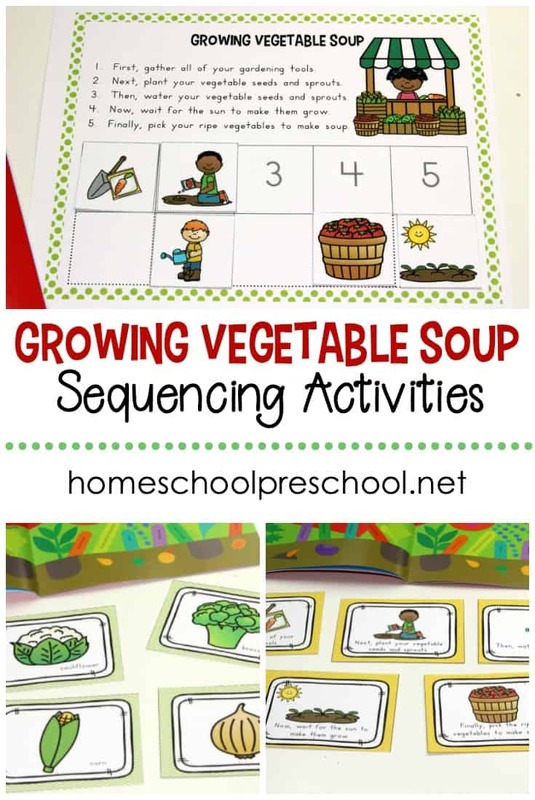 Perfect for winter homeschool lessons! 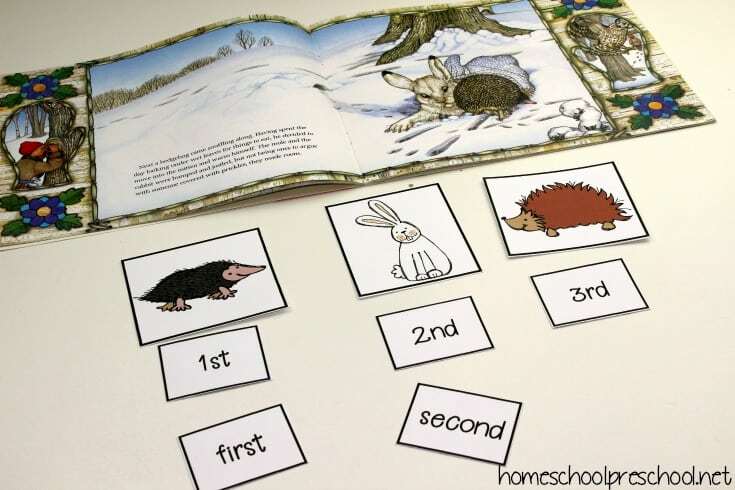 This story sequencing pack is perfect for preschool, kindergarten, and early elementary readers. Add it to your literacy centers for retelling practice. 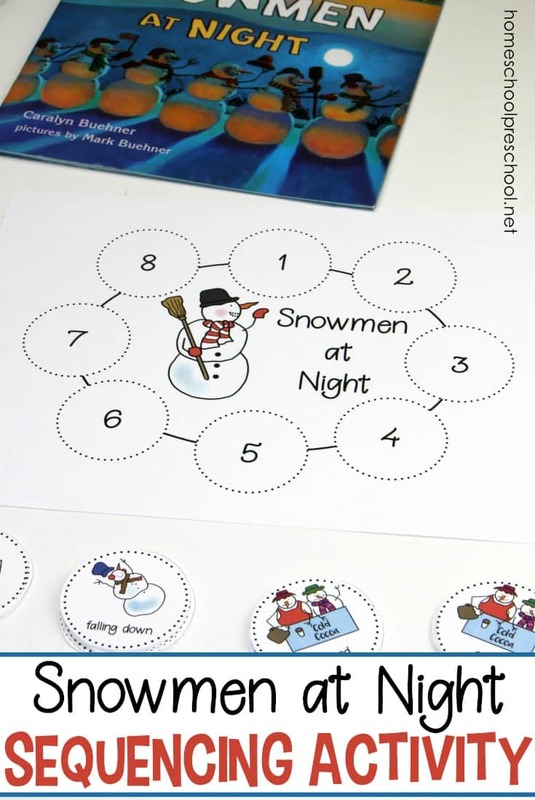 Or, add it to your math centers when you’re working on ordinal numbers and sequencing. 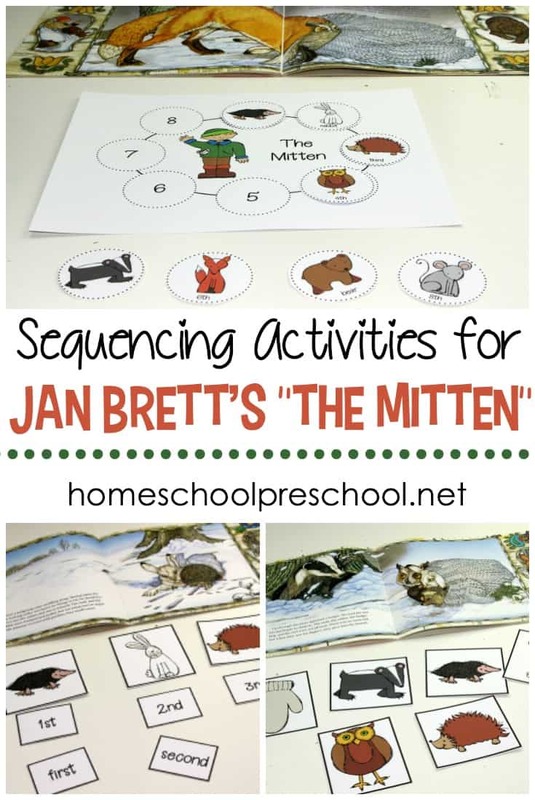 These activities for The Mitten by Jan Brett are only available to my readers. Click the button below, enter your information, and download your printables.